Little known but Newport has it's own apples. Now also known as Monmouthshire Beauty it was previously called "Tampling" after a Mr. Tampling, its original grower, or "Cissy", his sister. 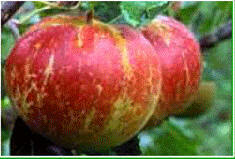 It's an apple which was particularly popular in the Monmouthshire area in the 19th century. According to Alan Roderick's 'Newport Kaleidoscope' Mr Tampling was from Malpas and during his time gave away many grafts of the apple. Following his death his sister Cissy tried to popularise it too and the apple became more closely associated with her and was re-named Cissy's Apple. Specimens were shown at fruit shows in the mid-1890's and it was again renamed 'Monmouthshire Beauty'. 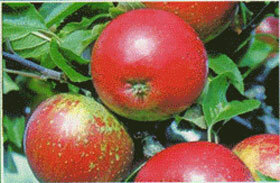 The apple became subject of a lecture to the Royal Horticultural Society by John Basham on November 21st 1899. Latterly the apple seems to be returning to the name of Cissy. You can find it at Swansea Community Farm and Herefordshire parks. It's described as Crimson flushed skin with firm flesh. Sweet and richly scented. If you want to purchase it you can now buy it from http://www.habitataid.co.uk/acatalog/Apple_Tree-Monmouth_Beauty.html for £28.50. Confusingly, it has a picture of Monmouth town bridge on the website but due to Tampling, Cissy and John Basham we all know where it comes from! The aforementioned John Basham was a fruiterer from Bassaleg who had a well known nursery called Fairoak. He raised his own variety - St Cecilia - from a Cox's Orange Pippin seedling in 1900. This juicy apple was a popular variety and has an intense aromatic flavour. The flavour is said to be at its most exquisite on St Cecilia's Day (Nov 22nd). St Cecilia is the patron saint of music. St Cecilia is a vigorous and heavy cropping tree. Pick in October and use from December to March. Its available to purchase at the website above. It was recently used along with bittersweets by local brewer Phil Palmer for his Newport Vintage Cider.